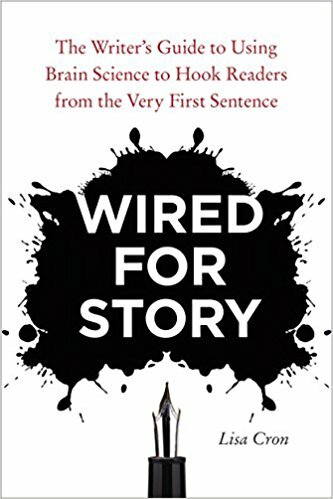 Wired for Story: The Writer’s Guide to Using Brain Science to Hook Readers from the Very First Sentence. By Lisa Cron. 272 pages. New York: Ten Speed Press, 2012. ISBN-10: 1607742454; ISBN-13: 978-1607742456. Cron’s primary advice is to take relevance and focus in our writing seriously. In keeping with this, she dispenses with the haughty tone (eviscerating other writers as “examples”) or the inane advice (“make index cards of words to increase your vocabulary”) filling other books on writing. Instead, she points out that stopping readers and making them search for a dictionary is not what makes a good writer. We need to intrigue readers, and keep them turning the pages we have written. Cron’s breezy, entertaining style makes her book a page-turner itself. It is succinct, with a dozen short chapters, each focused on putting to use a particular aspect of the psychology of stories. Her research provides a valuable source for further reading too, with references ranging from Brian Boyd’s seminal On the Origin of Stories through an eclectic collection of writers such as T. S. Eliot and Jennifer Egan. Movie stories are also discussed when they demonstrate the points Cron is making. John McClane’s bare feet in Die Hard appear as a sample of skillful setup, with the early, comic relief advice from a fellow airplane traveler leading to repercussions through the film (pp. 191–92). Another movie, “Fracture,” is called upon to illustrate the point that plot, in fact, is not a synonym for “story.” Stories are, Cron writes, about “what the protagonist is forced to learn as he navigates the plot” (p. 31). Wrapping up the book, “Little Miss Sunshine” makes an appearance as an example of a final, inescapable writing point: “There’s no writing; there’s only rewriting” (p. 219). The author of “Little Miss Sunshine,” Michael Arndt, reportedly put his draft through more than a hundred revisions (p. 237). One forewarning: the only thing that might slow readers down is digging old drafts out of drawers. A friend to whom I recommended the book confessed that she may never actually finish reading it because so many points of advice have prompted her to start again on previously stymied projects. Originally published in Wordcraft: The SWET Files 2013–2014, pp. 104–106. Copyright ©1996-2019 Society of Writers, Editors, and Translators. All Rights Reserved.